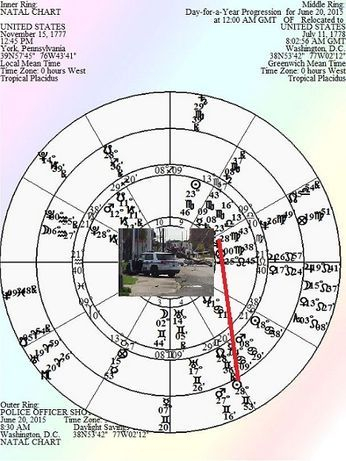 So here is another sad event that got triggered by the transit of the Sun moving up. A veteran New Orleans police officer was shot and killed early Saturday while transporting a suspect to the city jail, authorities said. The suspect escaped and was being sought by law enforcement officers. The New Orleans Police Department said Officer Daryle Holloway was shot while transporting the suspect, who managed to get his handcuffed hands from behind his back to the front, grab a firearm and shoot the officer. The police vehicle then crashed into a utility pole and the suspect, Travis Boys, fled. Emergency medical teams arrived at the scene and found Holloway in the front seat of the vehicle with an apparent gunshot wound. He was taken to a local hospital, where he died a short time later. A manhunt was underway for the 33-year-old Boys, according to Police Chief Michael Harrison. "He will be caught and he will be brought to justice for the murder of Officer Holloway and for this assault on our entire community," Harrison said in a statement issued by the police department. Harrison said Boys came from the back seat of the vehicle into the front seat . Traffic near the scene is backed up for blocks. Regional and state law enforcement agencies, along with the U.S. Marshals Service, were searching for Boys, who was arrested on an aggravated battery charge and outstanding warrant. The statement said Holloway was not the arresting officer. Holloway, 45, had been a member of the New Orleans Police Department since 1992. He was the father of three children. Mayor Mitch Landrieu decried the killing as "the lowest of the low." "Killing an officer in the line of duty is an attack on our community that will not stand," Landrieu said in a statement. "The heart and soul of New Orleans is heavy today as our community mourns one of our city's finest."